Bhajan Global Impact Foundation (BGIF) is a public charitable trust created to drive transformative change through high impact projects and evidence-based policy knowledge-sharing. We seek to create an ecosystem of knowledge, innovation, and impact by convening subject matter experts, policy analysts, social change makers, government bodies, corporates, philanthropists, and multilateral organisations. The Foundation has been founded under the guidance of the Bishnoi family who have devoted their lives to public service in India, particularly in the state of Haryana. BGIF wishes to engage with young, passionate, and committed people to help us achieve our Vision, Mission, and Objectives. In this vein, we have introduced the BGIF Internship Programme to provide young people with the opportunity to engage meaningfully with public policy and the development sector. We at BGIF are committed to the cause of Gender Equality and Women Empowerment as underlying themes across all Focus Areas. Applicants are welcome to apply under this area of interest during their Internship. BGIF offers Interns a unique experience of engaging with high level thought leaders, social change makers, government officials, corporate leaders, non-profits as well as citizens from diverse social, economic, and cultural backgrounds. Interns will have the opportunity to acquire and practice skills in business development, non-profit strategy, policy making and analysis, digital media, and project management. The BGIF Internship programme also intends to familiarise Interns with the pressing social and economic challenges in Haryana, through a four-day Rural Immersion Programme in Hisar and other parts of Haryana. 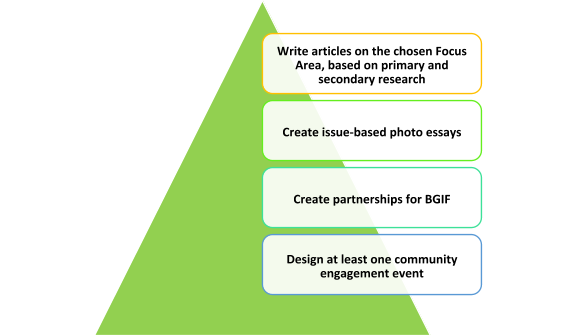 Interns shall be expected to produce evidence-based articles, write-ups, narratives, photo essays, and case studies; contribute to primary and secondary research undertaken at BGIF across our eight Focus Areas; and/or assist the Impact team design, and implement development projects, and community engagement activations. Interns shall get an opportunity to have their work published on the BGIF website, after joint consultations and revisions of their work. Current students (at the graduate level or higher) or working professionals with an interest in policy and/or on-ground development work. BGIF Interns are expected to engage with us for a minimum of one month. Internships can be extended, depending on the availability of candidates and their performance. Gurugram, Haryana, with field visits to the district of Hisar (and other parts of Haryana) for the Rural Immersion Programme. A stipend, commensurate with academic qualifications and professional experience, shall be provided. Applicants shall be felicitated with a Certificate upon the successful completion of the Internship programme. Articles, photo essays, etc. produced by interns shall feature on the BGIF website periodically.